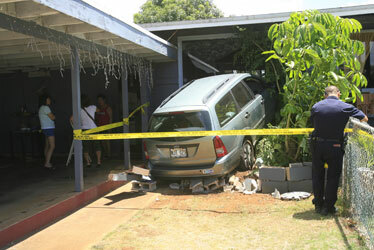 A station wagon crashed into the living room of an Aiea home yesterday along Moanalua Road. No one was hurt in the incident, which involved an elderly female driver who mistook the accelerator and brake pedals of the car. 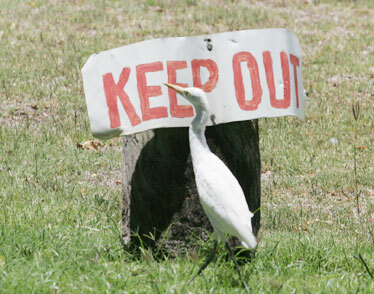 An egret at Moanalua Gardens stuck by this "Keep Out" sign all day yesterday. 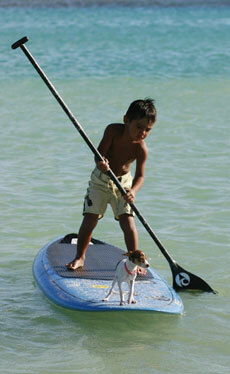 Kayde Mahuka, 5, paddled with a Chihuahua and fox terrier puppy named Maia at Ala Moana Beach Park on Sunday. Maia eventually jumped ship.